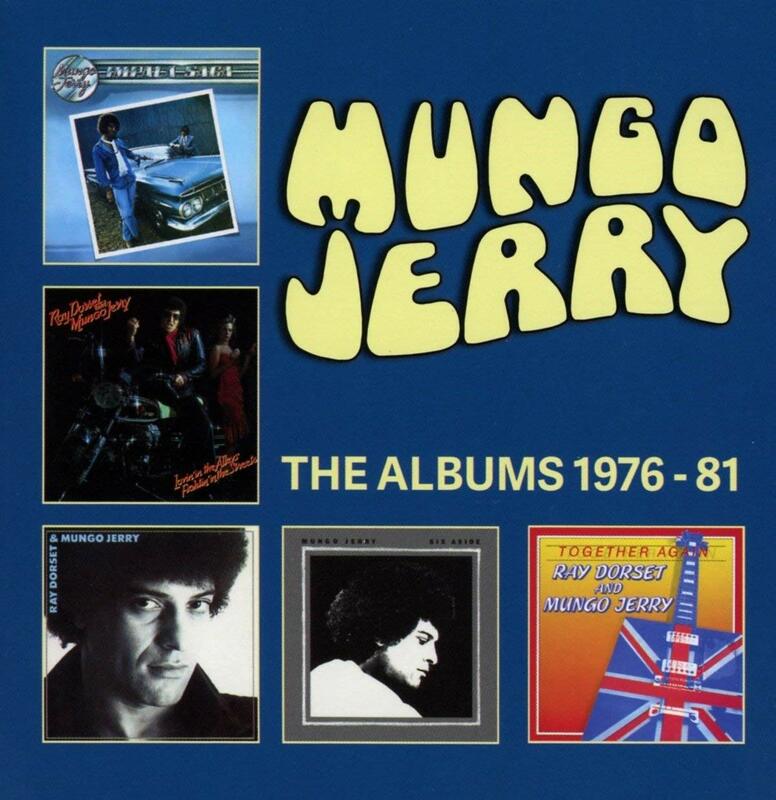 Discussions Magazine Music Blog: MUNGO JERRY - THE ALBUMS 1976-81 reviewed! MUNGO JERRY - THE ALBUMS 1976-81 reviewed! In the U.S., Mungo Jerry only scored one hit song – “In The Summertime” – and most Americans are under the impression that there wasn’t much else by the Mungos beyond that one single. My review of the Cherry Red Records five CD boxset MUNGO JERRY: THE DAWN ALBUMS COLLECTION may have surprised people unaware of those releases (you can read that review HERE). But guess what? I’ve got an even bigger surprise – Cherry Red has released a second Mungo Jerry boxset containing five more full length albums from the British act! Entitled THE ALBUMS 1976-81, this set veers into Blues/Rock/Glam genres and generally avoids the jug band Folk of their earlier releases. Led by vocalist/songwriter Ray Dorset, the band’s sound in their early days was often compared to Tyrannosaurus Rex, Marc Bolan’s late ‘60s Folk duo that would morph into T. Rex around the same time that Mungo Jerry arrived on the scene. Dorset’s quivering vibrato was similar to Bolan’s, which lead some critics to believe that he was influenced by Marc. However, the fact that Bolan was not yet an influential hit maker and that “In The Summertime” inspired Marc to mine Rock ‘n’ Roll’s roots on "Ride A White Swan" proves those assumptions are incorrect. But enough about rollin’ Bolan and back to the manic Mungos. RAY DORSET & MUNGO JERRY (1978) finds Ray and the boys returning to a more stripped-down sound. Gone are the Hard Rock riffs, replaced with a sound that is more Pop-oriented without being too commercial. The songs have melodic hooks again but that doesn’t mean that the band plays it safe. A recurring theme on each album seems to be the element of surprise and once you get comfortable with the direction the album is headed, they knock the chair out from under you. At this point, the eclectic nature of each album had become more and more eccentric and this platter is no exception. In fact, that is really what was/is so charming about the band – the constant twists and turns keep them interesting and fun. And in the end, Mungo Jerry is all about Rock ‘n’ Roll and fun. Even their Disco-influenced “Get Up An’ Dance” features a nod to Rock ‘n’ Roll with its “(I Can’t Get No) Satisfaction”-like guitar riff leading the charge. The CD includes two demos as bonus tracks. TOGETHER AGAIN (titled VIVA ENGLAND in some regions) was another Dorset tour-de-force filled with songs that took their sound into different directions, depending on which track you were listening to. From the rocking “Together Again” to the Disco/Funk-tainted “Rockin’ On The Road” (which recalls Roxy Music in spots) to the Country-fied “Marguerita,” you are pulled in different directions with the first three songs on the album! But it doesn’t stop there… “Heart Of Fire” is Quo-meets-Glam. The Mungos go Reggae (Rayggae?) with their cover of “Knockin’ On Heaven’s Door.” And yeah, the musical detours come fast and furious throughout the rest of the album. While some may consider that ‘unfocused,’ it enhances the listening experience. The six additional tracks offer up more fun. Ironically, the last track on the final CD in this set features “My Chair,” a song that musically recalls “In The Summertime” and brings the band’s career full circle. If anything, Ray Dorset and Mungo Jerry prove that you don’t have to follow the exact same musical formula to create a solid body of work. Sometimes, creativity and fun should be your only guides. Viva Mungo Jerry!